One reason for this mysterious development is that we humans have developed more complexity in our created social systems than we can manage. Despite the founding of General Systems Theory almost a century ago, most of us still default to simplistic, linear, cause-effect thinking when it comes to designing and intervening in these more complex systems that often defy our ability to control them. One of the quirky things about human-made social systems is that they take on a purpose that often overrides their intended purpose. That overriding purpose is to survive at all costs. Anyone who has attempted a system intervention in the hopes of making it more functional has most likely come up against this survival mechanism, usually in the form of resistance to change of most any kind. In a way, you could say these systems develop minds of their own. Systems often see attempts to change as threats to their survival and, therefore, treat change efforts much like human immune systems respond to infections. They rally forces to combat the “infection.” Some of these forces are visible and some are not. Years ago I had a conversation with MIT’s Peter Senge, author of The Fifth Discipline amongst other books on systems and my go-to-guy when it comes to systems thinking wisdom. As best I recall he said that whenever you have well-intended competent people working to solve a problem and no improvement is forthcoming, you have a systems problem, not a human problem. But most people who tackle systems challenges do not think systemically (or holistically); they resort to cause-effect or linear thinking. As a result they inevitably end up blaming some scapegoats for the problem, make a personnel change, then seem surprised when the problems still persist. There are plenty of resources where systems thinking can be learned and practiced. There are plenty of books, seminars, college courses and consultants out there. But it takes the will to think differently to take advantage of these resources and learn to be more effective in resolving systems challenges. 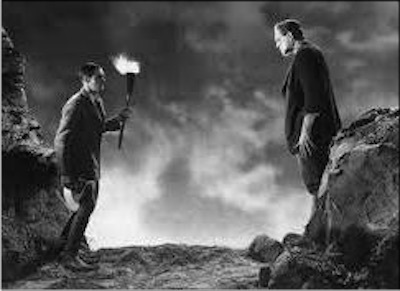 Unlike the fictitious doctor in the movie, we can solve the mystery and reclaim mastery over our “Frankensystems” by learning how best to engage with them.